his is a tale taken from the heart of the Great Middle Desert where three of its rather unusual denizens inhabit an arid and enchanting land. Tommy is a young tumbleweed with a longing to travel to the distant horizon and learn about the mountains that so intrigue him; Dusty is a dust devil whose array of hats are fashioned from fine sand and who considers herself the desert's foremost detective; and finally there is Crawfoot, a crow caught between his desire to remain within his familiar surroundings and the unexpected opportunity to add to his formidable collection of shiny things. Fate has thrown the three together and theirs is the story of life, of companionship, of exploration, of travel and discovery. 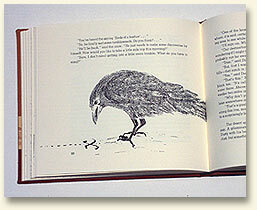 One could say it is a book for youth for it is a story filled with a youthful sense of adventure. One must also say it is for those with a youthful spirit that sometimes reappears after a sobering brush with adult life. A Selection of Reader's Responses to Review Copies of Desert Dreams. You know, ever since the Don Juan thing, Castaneda, Carlos Castaneda? Well, I knew there was something about the crows. They were magical, you know? But the idea that you could know them personally, I just didn't think possible. Until this book, that is. In my studies of the desert fauna and flora and my own specialty the desert mineralsI have yet to come across anything resembling the symbiotic relationships expressed in this work. And I say this particularly in regard to the dust devil (devilus dustyius). I would want more data from this Great Middle Desert but, at the moment, I don't have the appropriate maps at my fingertips. I don't know what to say. I tell the children to read, read, read. And they do. What voracious appetites. This is a wonderful library, but there are other books they could be reading. This book was given to me and I've read it three times. Quite frankly, I don't want to give this book up. Let them get their own copies. Well, I suppose I could read it to them. Case in point, a talking tumbleweed! This is where Darwinian Theory points its prickly little finger at honest society. Am I really supposed to feel sorry for the poor Shin-ese? And what about that swipe at clear cutting? I tell you, it's this kind of cow do-do that makes us forget our purpose here and the reason we were given this planet in the first place. On its face this story appears to be another dust-devil-meets-young-inexperienced- tumbleweed-about-to-set-out-on-a-journey-of-exploration tale. But there is something just beneath the sand, something special in this story that I've never encountered in any other book of this genre. . . .
Desert Dreams? Yes, I have a copy, review copy, still in its original wrappers. What? Are you buying or selling? Oh, I see. Is it out of print yet? This one I'm laying aside and keeping like fine wine. Can I get another copy? I've lived out here longer than I can remember, and I can tell you it's true, every last work of it. I've seen 'em myself with my own eyes. You city folks can laugh all you want. The type and multicolored illustrations are printed letterpress on Legion Letterpress paper and bound in Japanese cloth over boards. 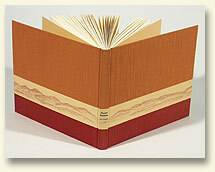 The book measures 8 x 9 inches and is 144 pages in length. 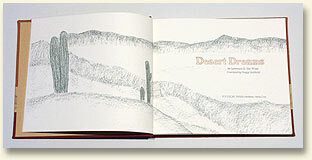 Desert Dreams is limited to an edition of 185 signed and numbered copies. The price is $130. Orders may be placed by telephone, email or letter. Please include $15 for shipping. State sales tax applies to California residents. Book dealer, institutional and Standing Order discounts are applied.